Radek has fished the waters of the Fraser River and its tributaries for the past 20+ years while growing up in Maple Ridge. Initially Radek started his guiding career as a subcontractor with STS Guiding. Five years later, it was time for a change and Double Header Sport Fishing was conceived. As an owner/operator, you are not limited by how far you can afford to go to get to the fish or how long you can stay out if the bite comes on late in the day... We do whatever it takes to ensure you'll have the best opportunity for a successful outing. Our boat and equipment are top notch. Our main boat is a 22' welded aluminum jet boat that is equipped with heat, canopy, and all the required safety equipment. We're set up to carry up to 5 guests. We keep our fishing gear in top shape, to ensure the big one doesn't get away. 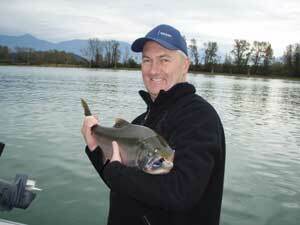 Radek is the only Czech/Slovak speaking guide fishing the Fraser and Harrison Rivers. Why Choose Double Header Sport Fishing? Most prospective clients put quite a bit of thought into choosing a fishing guide. Rightfully so... After all, we all advertise great boats, quality fishing gear that's in good shape, experienced fishing guides and so on. At Double Header we feel those are necessities, not advantages. So what really separates us from the rest you ask? Just fishing... at Double Header, we focus on just fishing! No scenic boat tours, no bird watching, just fishing... Focus helps create success! Flexible hours... at Double Header, we understand not everyone wants to fish when 95% of the other charters do. Maybe you're getting in late, or would like to enjoy a barbeque dinner on the water. We promise to do our best to accommodate your schedule. But don't take our word for it, read what our clients have to say!